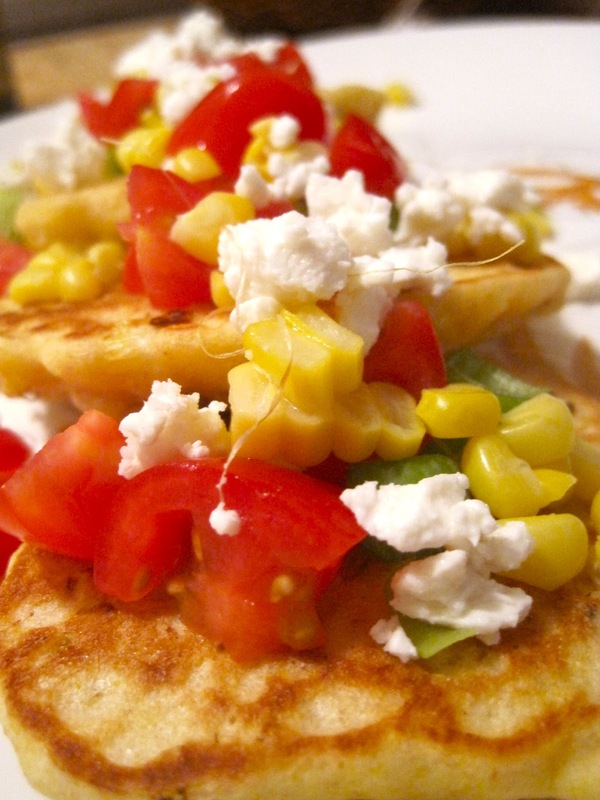 Mmmm....summer's most iconic vegetable makes quite the splash with these Skillet Corn Griddle Cakes. "Straight from the garden, corn is so close to perfection that I don't do much more than just buff up what's already there," says Scott Peacock, award winning Alabama-born chef. And yes sir do these wonderful little cakes taste Southern! Think equal parts cornbread, biscuit, pancake, and potato latke, and you have yourself a winner. Freshly browned corns' nutty sweet kernels create the ultimate flavor in this recipe. Fun colorful topings like chopped scallions, tomato, and feta cheese complete the delicious dish. Corn is a whole grain! Don't be fooled by its prevalence in the American diet- did you know that corn provides 21% of human nutrition across the globe? Corn's featured nutrients are Vitamin A- it has more than 10 times the quantity of other grains- plus significant amounts of antioxidants and carotenoids. Corn is also gluten free. When cooking with dried corn products, make sure your corneal, corn flour, grits, or polenta are labeled "whole corn" or "whole grain corns"- if it says "degermed corn", it is no longer whole grain. My only tip for this recipe is to make sure to thoroughly brown your corn! It should cook undisturbed until well browned on one side, then you can turn. "Resist the urge to stir too soon!" cautions Peacock, and I almost had to sit on my wooden spoon to comply. My innate reaction was to stop the corn from burning, but after it starts to emit that wonderful rich nutty flavor you realize why its worth it. *If you don't have access to a grill, you can roast the corn cobs in the oven. Peel back husks and bake at 350 degrees for 35 minutes, turning over halfway through. 1. In a 12-inch nonstick skillet, heat 1 Tbsp. vegetable or olive oil over medium heat. Add the corn kernels in an even layer, sprinkle generously with salt. Cook, without stirring, for 3 or 4 minutes until the corn kernels are sizzling. Give the pan a shake and continue cooking about 16 minutes total, until kernels are browned. Reserve 2 Tbsp. of the browned corn for garnish. 2. Meanwhile in medium bowl whisk together flour, cornmeal, 1/4 tsp. salt, and baking powder. Whisk in milk, egg, and the 1 Tbsp. vegetable oil, mixing just until batter is smooth. Stir in chopped onion and remaining browned corn. 3. Wipe out skillet with a lightly oiled paper towel and heat over medium heat. Drop batter by 1 or 2 Tbsp. measures; cook until browned on one side and batter appears set, about 1 minute. Turn and cook 1 additional minute or less. Repeat with remaining batter. Set aside and keep warm. 4. Top each griddle cake with sour cream/yogurt if desired, chopped tomato, reserved browned corn kernels, sliced green onion, and the ricotta salata or feta cheese. Salsa verde also makes a nice addition.